Sometimes when I search for solutions for my home networking problem, I frequently see some people suggesting that I ping my PC by IP and/or by computer name. What does PING command actually do? What's the point of using this command? How do I read and understand the results? Ping is one of the oldest and most basic network diagnostic tools. It's present in just about every modern, and even not-so-modern, operating system. In concept, the tool is very, very simple: it sends out an "Are you there?" kind of request, and expects to hear back a "Yes, here I am!" kind of response. Continue Reading: What is "ping", and what does its output tell me? One of the common questions I get after talking about image backups is "Great – how do I make one?" There are many ways and tools with which to make image backups. Detailed instructions will vary, of course, depending on exactly which tool you want to use. In the brief video linked above, I'm going to show you the steps to create an image backup using Macrium Reflect's free edition (there's a link to the transcript of the video at the end of this post). This isn't meant to be an exhaustive how-to, but rather a very quick demonstration of just how easy it can be to create an image backup. As brief and simple as it is, it's possible that this may be all you need to create your own backup image. We really hear you when you talk to us . The last video I watched, you advised us to keep learning and that is so right. But I didn't adopt the attitude until you mentioned it. Yesterday I spent time online finding out how to remove anti- virus software without messing up my computer. Most people don't know how to do this. I searched & searched while putting two plus two together on my own and now I have knowledge that I didn't possess last week. Learning makes me more independent. These other websites out here don't really help. They send people to their forums. It's like the blind leading the blind. That is one of the reasons I thank you so often. You attempt and do help us. Leo, boy do I relate. I worked in surgery, during surgical procedures, for over 25 years. Medical terminology is used widely, in medicine. It really is a jargon, that you must know, to understand what you are scheduled to do. I am a self taught geek. I retired and got my first computer, back in 1996. Yes, I am a late comer. My first computer was something else and a BIG problem. It had a Mwave Modem with Sound Card, combined. IBM made these suckers and they were super sensitive. One of the worst technical components, ever!!! I finally, got a newer computer, after a computer tech came out to my house and totally crashed my brand new motherboard. The company sent me out a brand new updated computer. My dear friend is the one, who taught me the technical terms for the computer. In the beginning, I would use the wrong term, in the right sentence. I finally, decided that I would build my own computer from scratch. Once, I started to build computers, terminology became clearer to me and I knew what components, motherboards, CPUs to use, when building a computer. I learned a new jargon and am proud that I did. Yes, that's how most feel about driving cars...."most of us" don't want to know "how" a car works...we want to be able to drive it. Of course, I'm not one of those that come under the "most of us" heading. I'm curious about how things work, be it a car or a computer. I would like to learn everything I can about my laptop, mostly so I will be able to make any repairs needed myself. I want to take the "mystery" out of my laptop. But I really don't know where to begin. Got any suggestions? There is a free Blue Screen view package from Nirsoft that I have downloaded and used in the past. It doesn't make you any more knowlegeable, but at least it gives you more information that you can use to search with. (There are also instructions on how to get Windows to generate MiniDump files for a Blue Screen if your system doesn't already). 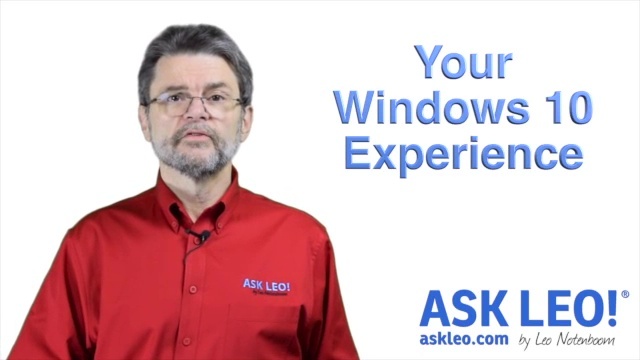 I agree with Leo that for a 1-off it's not worth following up, but if at least you ensure that you have a minidump file, then you can always follow up later (and see if it's the same problem) if you get it repeatedly.